The loss of connectivity in intermittent streams can limit aquatic-invertebrate access to food resources, with different resources available in individual pools. 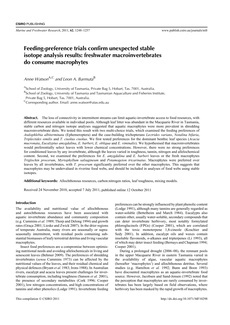 Although leaf litter was abundant in the Macquarie River in Tasmania, stable carbon and nitrogen isotope analyses suggested that aquatic macrophytes were more prevalent in shredding macroinvertebrate diets. We tested this result with two multi-choice trials, which examined the feeding preferences of Atalophlebia albiterminata (Ephemeroptera) and the case-building trichopterans Lectrides varians, Notalina bifaria, Triplectides similis and T. ciuskus ciuskus. We first tested preferences for the dominant benthic leaf species (Acacia mucronata, Eucalyptus amygdalina, E. barberi, E. obliqua and E. viminalis). We hypothesised that macroinvertebrates would preferentially select leaves with lower chemical concentrations. However, there were no strong preferences for conditioned leaves by any invertebrate, although the leaves varied in toughness, tannin, nitrogen and allelochemical content. Second, we examined the preferences for E. amygdalina and E. barberi leaves or the fresh macrophytes Triglochin procerum, Myriophyllum salsugineum and Potamogeton tricarinatus. Macrophytes were preferred over leaves by all invertebrates, with T. procerum significantly preferred over the other macrophytes. This suggests that macrophytes may be undervalued in riverine food webs, and should be included in analyses of food webs using stable isotopes.